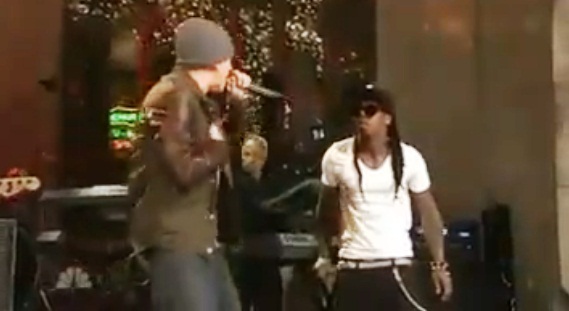 *Flanked by a full band, Eminem and Lil Wayne joined forces for a performance of “No Love” on NBC’s “Saturday Night Live” over the weekend. “The energy in the building is historical and it’s extra special to see everybody fight for position backstage to see Lil Wayne take over ‘SNL,’ ” DJ Scoob Doo told MTV News. Later in the show, Eminem performed “Won’t Back Down,” dressed in a black jacket and grey skull cap, with his band. As Em wrapped his song, the musicians began playing the acoustic version of Lil Wayne’s recently released “6’ 7’” track featuring Bronx upstart Cory Gunz. While the young MC wasn’t present to spit his bars, Lil Wayne’s presence more than made up for his absence.